Basically, it’s grey, it’s wet and it’s getting me down. If this also describes your current predicament, this pasta dish could rescue you (at least until it stops raining). Sweet, plump scallops and spicy chorizo on a bed of slick linguine – such a quick, bright midweek supper, this is (posh) comfort food at its finest. I’m not sure Noah ever rustled this up on the ark but I for one think he would have enjoyed it! *Check your chorizo ingredients for gluten and substitute the linguine with gluten-free pasta for a GF version. **Substitute with dairy-free spread for a dairy-free version. Pop the chorizo in a wide-based pan on a medium heat and cook for about 5 minutes, until it has released its oils and is just about cooked through. Plunge the linguine into a saucepan of salted boiling water and cook according to instructions. Tip: You want it al dente – with a little bite to it – so keep tasting during the last minute or so of cooking and then drain it prontissimo! 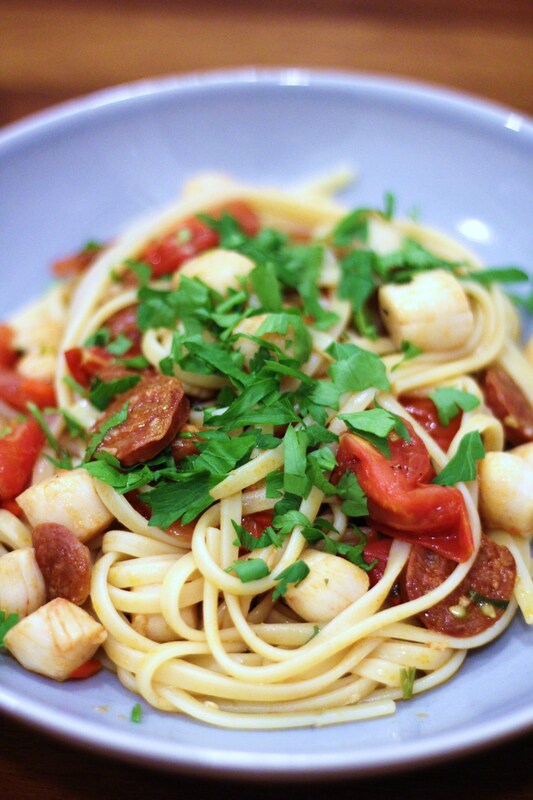 Once the chorizo and scallops are cooked through, remove from the heat and stir in the linguine, 1/2 the parsley leaves, the butter and lemon juice. Serve with the remaining parsley leaves sprinkled on top. Source: Recipe and photos from pip & little blue. 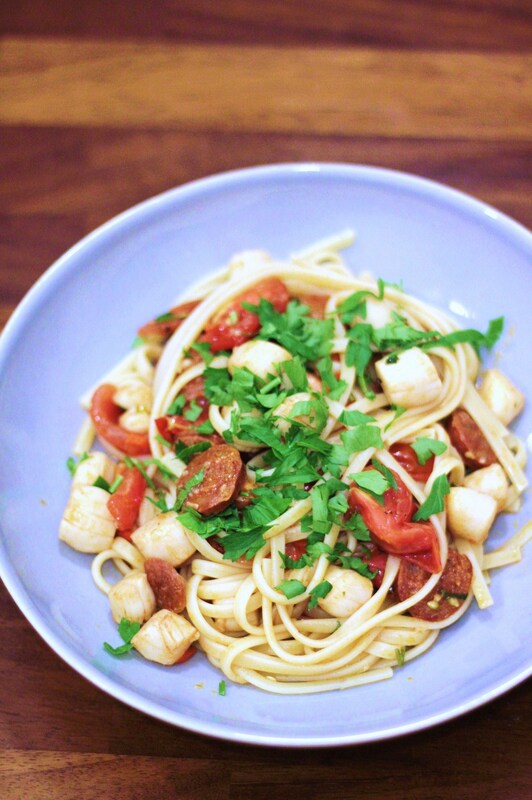 Tags: chorizo and scallop linguine, dairy free, easy, gluten-free, Italian, midweek, pasta, recipe, seafood. Bookmark the permalink.